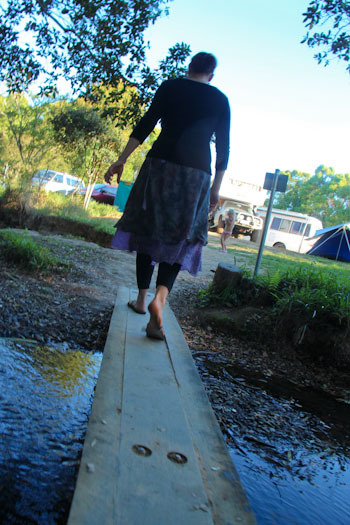 The venue for this month’s Dancing Ground Festival is Hosanna Farmstay, a camping ground located outside Murwillumbah and less than an hour’s drive from Queensland’s Gold Coast. It was great to be camping again, among friends, and at such a venue as Hosanna. 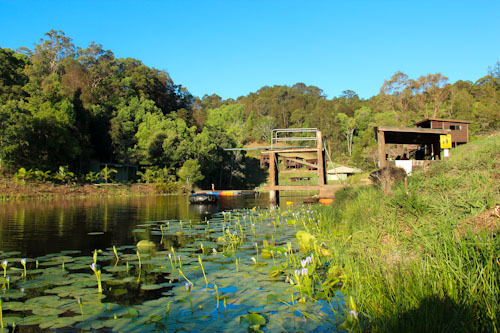 A three-metre diving board provides instant entry into the lake at Hosanna. Although we camp in The Gifted Gypsy, small, 4-bed huts are available for those who don't want to bring their own accommodation. 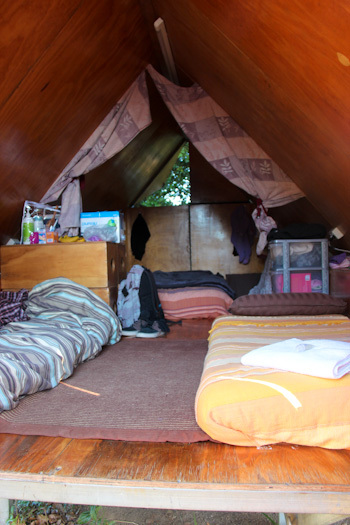 Bedding is provided in the huts, and the soft furnishings are reminiscent of a Bedouin's tent. 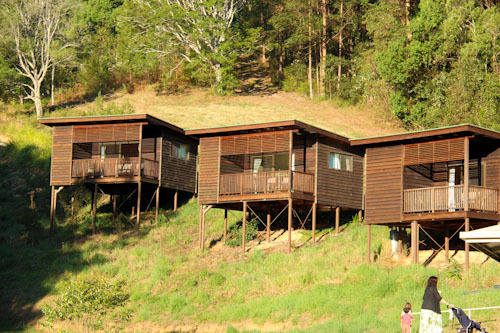 Cabins are also available for those who don't want to "rough" it. 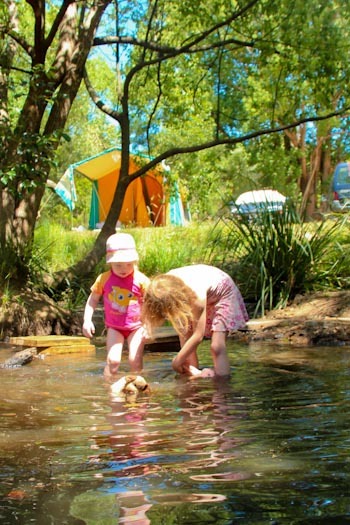 A creek runs through the middle of the grounds, providing shade and cool places for wading. Swimming at the lake is encouraged, and kayaks are provided for those who prefer to paddle. 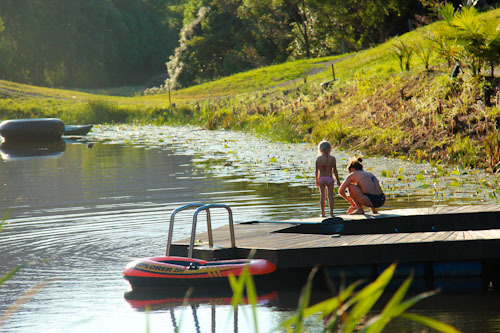 The octagon-shaped pontoon holds a net to make a shallow, safe swimming place for children. The facilities at Hosanna are all in good condition. There’s a wood-fired sauna, shade huts adjacent to the lake, catering facilities for large bookings, and so many extras to give visitors a really good time. 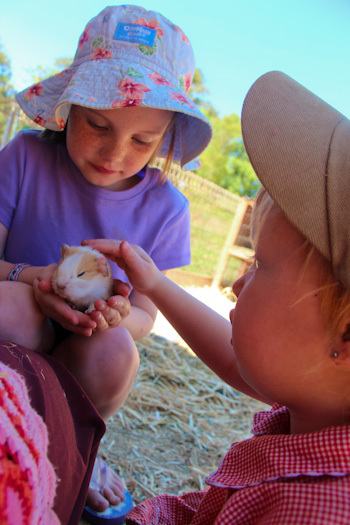 During our visit, a number of baby guinea pigs are available to hold and pet. 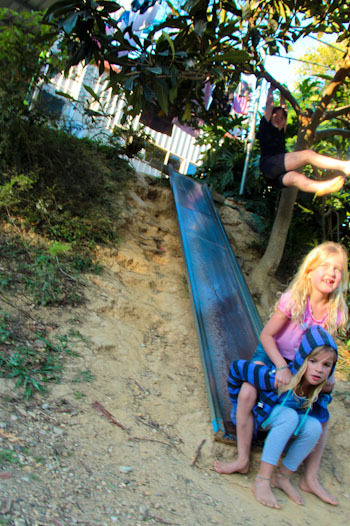 A metal slide sits in the shade of the trees and serves as a fun short-cut from the amenities block to the creek. Our girls love playing in the creek which runs right by our bus. 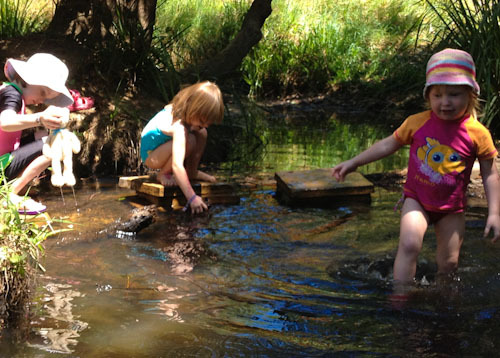 Although there are swimming holes in the creek, the parts that we explore are less than knee-deep for a toddler. Although we were camping as part of a larger community, we spent a lot of time in Hosanna around our own camp-site. We’re getting used to living in The Gifted Gypsy, and I’m happy to encourage the girls to adopt it as their new home. 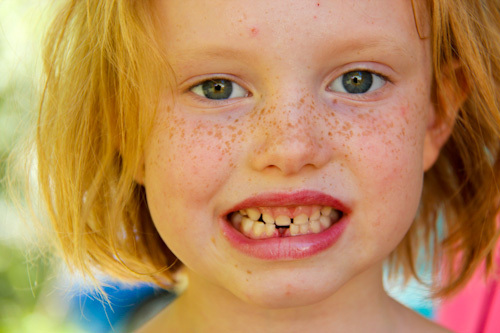 Brioni lost her first tooth yesterday, and it's lost somewhere on the grounds here at Hosanna. 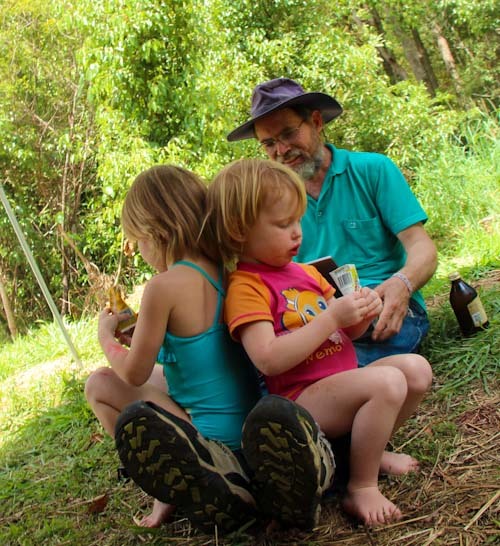 We've enjoyed camping here at Hosanna with our friends Delcie and Alan and the rest of the Dancing Ground community! We’re booked to come back to Hosanna Farmstay next month, and after having a taste of its facilities, I’m looking forward to exploring more of its pleasures. 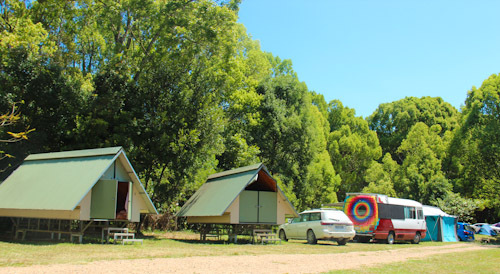 If you’re interested in camping in northern NSW, I’d recommend it highly — check out Hosanna’s comprehensive website for more information.